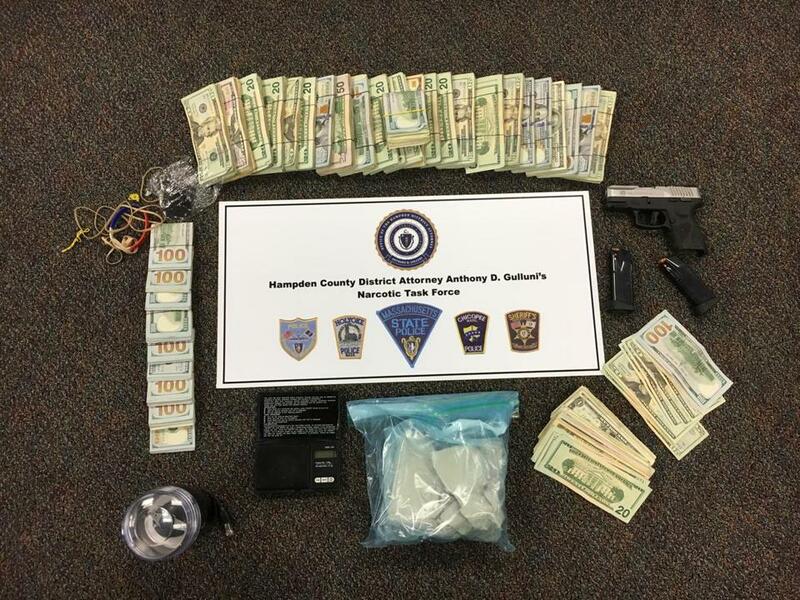 Officers from the Hampden County Narcotics unit seized 816 grams of heroin, $35,000 cash, and a handgun and ammunition from a suspected heroin mill in Springfield. More than 800 grams of uncut heroin and $35,000 were seized in Springfield on Tuesday afternoon from what State Police believe was a heroin mill. Arquelio Cajigas, 44, of Springfield was charged with trafficking heroin, firearms charges, and driving with a suspended license, the Hampden district attorney’s office said in a statement. State Police and Springfield police executed search warrants Tuesday afternoon at two locations. The district attorney’s office said they found a backpack containing 816 grams of heroin, a grinder, scales, and packaging material at one address. At the other location, police also allegedly seized a handgun, two magazines, ammunition, and about $35,000 in cash. The district attorney’s office estimated that the 816 grams of heroin was enough to fill about 80,000 bags for street sales, valued at about $400,000. “We continue to fight this epidemic by aggressively going after drug traffickers while also trying to assist those fighting addiction,” District Attorney Anthony Gulluni said in the statement. Cajigas was arraigned in Springfield District Court Wednesday and is being held on $250,000 cash bail. District attorney’s spokesman Jim Leydon said Cajigas will reappear in court within the next 30 days. Laney Ruckstuhl can be reached at laney.ruckstuhl@globe.com. Follow her on Twitter @laneyruckstuhl.